Well, I think it’s safe to say that it’s officially winter coat weather now. Between the snow and the rain along with temperatures starting to hit zero, nice evening walks are getting a little chilly and the need to go into a pub for a nice drink and a warming, stick-to-your-bones good meal. Fortunately for us, Toronto is not short on amazing pubs, but some of the true gems are the ones that pour beer made in-house. The following is a selection of just a few of the places you can get some delicious beer with your food, all made in-house. Let’s face it, there are many reasons to go to Amsterdam’s massive dining space, but this Saturday the main reason should be to line up for Double Tempest Day. At 11 a.m. the doors of the BrewHouse will open and bottles of this year’s Barrel Aged Double Tempest Imperial Stout will go on sale for $15 each (with a limit of six per person). Before you scoff at the price of that, it should be pointed out that lineups for this truly world-class beer are very common and the price is very much much worth it for the rich flavours of chocolate, coffee, dark fruits, and bourbon. If you show up though, make sure to stick around at noon for the celebrations. Food, live music, and limited edition beer samplings will be going down. Despite a fairly rocky start to the critical reception of their beer, Bandit Brewery’s brewmaster, former Niagara College brewing student Ben Morris, has refined his recipes in the past few months and in doing so has found more of a stronger voice that represents Bandit as a whole quite well. The Farmed and Dangerous Farmhouse Ale now makes use of wild yeast from Ontario’s own Escarpment Labs, resulting in a beer with a nice peppery dry character complemented by a swirl of sweet Belgian notes. Another, the Cone Ranger IPA, has gone from a fairly standard, textbook English-influenced IPA to a beer with rich notes of grapefruit, pine, and honey that pop above the malt backbone supporting it. The food puts a focus on shareables, but if you really want to warm up, the beef stew is sure to do the trick. 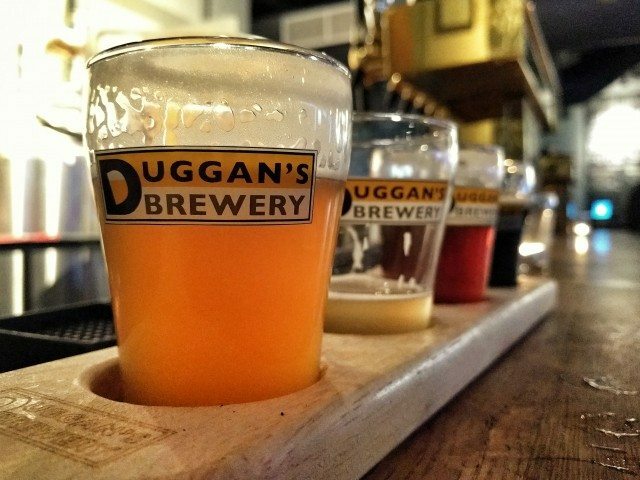 I don’t feel that Duggan’s, located in Parkdale right on the corner of Brock and Queen, gets enough credit for being a truly great brewpub. With an extensive selection of beers made by longtime industry pro Michael Duggan, this second iteration of the legendary brewpub features live music and mouthwatering pub grub. The Number 7 Irish Stout is beautifully creamy, with warming notes of chocolate and just a light amount of coffee and the Number 3 German Pilsner is a lovely representation of the style that includes a nice punch of grainy bitterness mid-palate. For food, the wings are always a winner and the poutine will go fast. It’s been awhile since Creemore’s craft beer extension, Batch, opened its doors at the former building previously occupied by other brewpubs like Duggan’s, Beer Academy, and Denison’s. And since then, brewer Andrew Bartle has still been rocking out and having fun with approachable styles. The current clear favourite among staff and customers is the Porter, and it’s much-loved for a reason. A light to medium body with notes of cocoa and espresso make this a warming beer to get away from…well…*gestures out the window* that. Aside from that, the Witbier is a wonderful dance between coriander, orange peel, and Belgian candi in a creamy blanket. While batch has some great pub grub in their dinner menu, the real treat is to stop by for brunch, with buttermilk pancakes, brisket hash, and an exquisite eggs benedict. It’s no secret that Folly Brewpub is one of the better brewpub destinations in the city, and not just for their wonderful beer. They also feature world-class food and the most extensive spirits selection in the city. Suggested beers include the current iteration of the ever-changing Rhizome beer, which makes use of Equinox and Mosaic hops this time round. The end result is an overall bright beer, with a beautiful combination of citrus and tropical fruit flavours. Additionally, do check out Inkhorn, which has taken quite a departure from its more tart predecessor and is, to my excitement, a whole different beer on its own. I won’t say too much except this: High quality Viva Puff. Dark chocolate and raspberry, folks. Hell yeah, you want that. As for the food, under the care of Chef Anthony Santi, Folly offers a modest but solid selection of food, including glazed beef cheek and smoked potato croquettes.